This is the second Toolkit I have created to help out Game Masters new and old for 5E. Similar to the first, you will find fully detailed dungeons and one-shot adventures, most of which can be dropped in any traditional fantasy world with minimal effort. This Toolkit also comes with 100 new monsters as part of Nerzugal’s Extended Bestiary with numerous unique creatures as well as expansions upon existing types such as centaur, kobold, ogre, orc, and even bullywug and includes beautiful artwork for 26 of these unique monsters! In all, the Toolkit contains 5 full dungeons, 5 one-shot adventures, 10 puzzles, 100 trinkets, and 100 monsters to help develop your world! 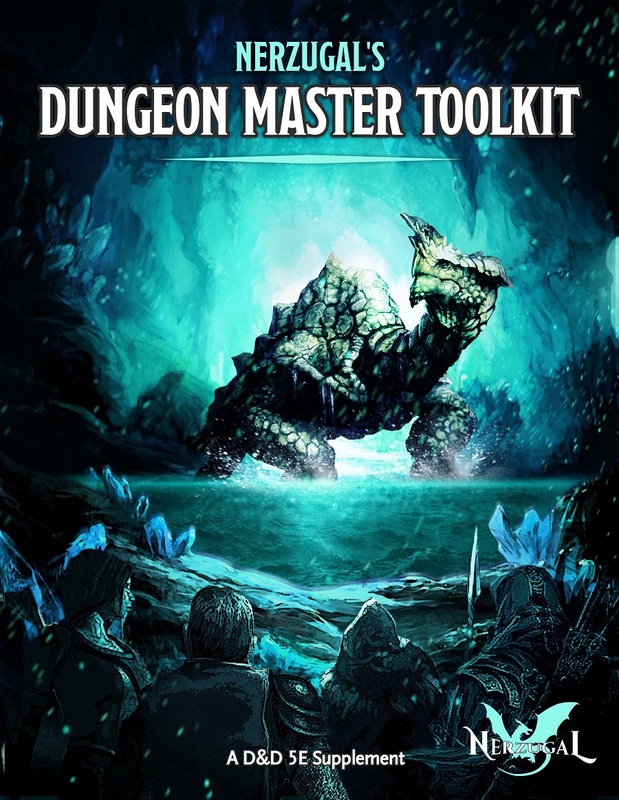 The Toolkit was created with both novice and veteran game masters in mind, giving detailed guides and walkthroughs that are easy to follow and can be dropped into most settings. So if you are just looking for some new monsters to throw at your party or if you are someone who has always wanted to try GMing but were afraid to go at it alone, there is something for you within the Toolkit! For a look at the contents of the book check the previews to see the Table of Contents, one of the dungeons included, and a few of the monsters from the bestiary. If you are interested in monsters but not necessarily in dungeons or one-shots, you can purchase just the monsters for half the price of the full Toolkit. 1.0.8 - Fixed an issue causing many stat blocks to be unreadable for monsters. The Monsters of the Extended Bestiary are now listed as part of the Kobold Fight Club Encounter Builder! Physical copies of the Toolkit are available for sale once again! You can also click the image above to download Nerzugal's Dungeon Master Toolkit or Nerzugal's Dungeon Master Toolkit 2 for free on the DM's Guild! My first Toolkit is a platinum best seller with over 40,000 downloads and has been a top seller for two years. The second is newly released with 270 pages of content for you to enjoy with over 50 new illustrations! Needs a printer friendly version as well, please. Sigh, never mind. Lol, it already is, beyond the cover. 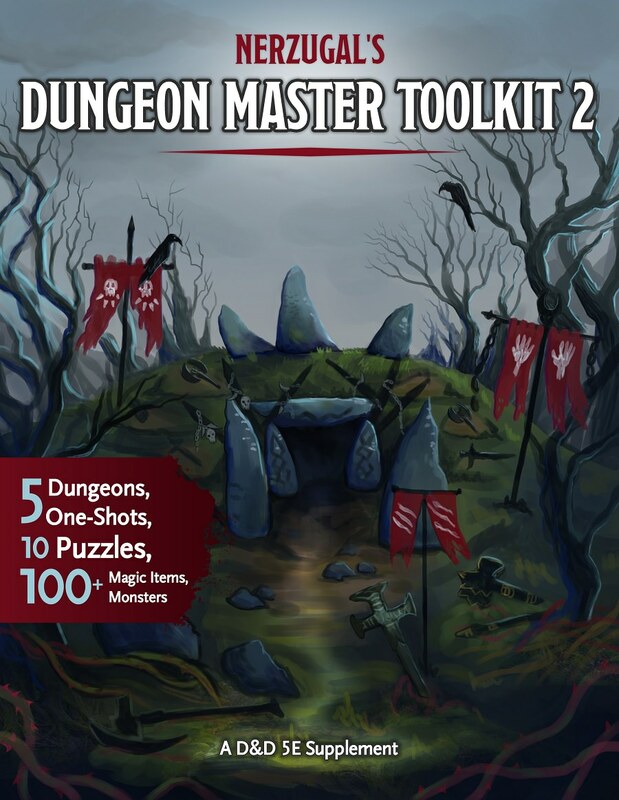 What makes this different from Dungeon Master Toolkit & Dungeon Master Toolkit 2? Sorry about the extremely delayed response. Apparently my notifications were turned off for new comments on this product so I didn't realize there were new posts! This is along the same lines as my Dungeon Master Toolkits but this one is using the Open Gaming License so I maintain the rights to the content and can distribute it as I please. It contains monsters, one-shots, dungeons, puzzles, and more just like my others and works with D&D 5E. The "A Problem of Potions" puzzle is currently missing where the Message Revealment Powder is found. As it is now, this puzzle is unsolvable, for the last note cannot be revealed. Hey Erick, sorry about the extreme delay getting back to you. I had my notifications off on accident for this and didn't realize anyone had commented! The Message Revealment Powder is on the list of items that the party can craft by combining other ingredients. If you look on the list you will find - Message Revealment Powder - Crushed Dragon Turtle Shell + Sand of the Sphinx + Black Ink. Hopefully that helps! Oh yep, that one is a typo on my part. Sorry about that! It should share the Unaligned property of other hydras! Ability scores for Cube of Anomalies, Soul Harvester, Dragon Knight, Obsidian Drake, Grinning Marionette, Grim Puppeteer, Herald of Lightning, Living Temple, Maiden of Ice, Merfolk Hydromancer, Mysterious Starcaller, Mystic Spellblade, Obsidian Golem, Terror Beast, Emerald Queen, Timeless Chronomancer, Zoblin, and Zoblin Boss are unreadable. Oh wow, not sure when that happened. I will work on getting that fixed ASAP. Thanks for letting me know. I believe all of the issues have been fixed. Please let me know if you see something I missed and thank you for letting me know! In the tower of trials one shot there's a mention on level two that they need to do the 'Grand Expanse' puzzle but I don't see it listed. Should this be called a different puzzle or is something missing? The "Grand Expanse" puzzle had its name updated to "A Stone's Throw Away" and I failed to update the reference to it in the dungeon initially. If you download the newest version of the PDF it has the correct name in place for the Tower of Trials now. Sorry about the confusion. Hey, your Section 15 for the OGL seems to be incomplete. There's no line for the SRD, or for the book itself. If I want to use the open content from this work, would the following be okay as a Section 15 entry? Nerzugal's Game Master Toolkit Copyright 2017, Nerzugal Role-Playing. Also, I noticed an issue that might cause some problems for you. Bullywugs aren't Open Game Content. They're not WotC Product Identity, so you might be fine, but if you want to be on the safe side you might want to change them to Frogfolk to avoid stepping on WotC copyrights. The entry for the book itself and its details for use are on the first page of the document. I wasn't aware it needed to be copied into Section 15 of the OGL document as well. The format I used was a sample used by others. I didn't think the SRD needed to be explicitly referenced with the rest of the OGL text fully written. If that is something that needs to be added I can certainly update my documents. In the OGL I see	"beholder,gauth,carrion crawler, tanar’ri, baatezu,displacer beast, githyanki, githzerai, mind flayer, illithid, umber hulk, yuan-ti," as the list of restricted creatures for 5th Edition. Is Bullywug listed somewhere else? Because that is the only list of creatures I could identify as far as creature restrictions. Thanks for the advice btw. The SRD needs to be referenced in the Section 15 if you're using any Open Game Content from it, which is basically true by default if you're making new content for 5e. The bullywug is in the same grey area that monsters like the slaadi or rilmani are. They're not part of the short list of restricted monsters, but they've also never been made Open Game Content. What this means is that the only rules applying to their use are regular copyright and fair use law - and it tends to be safer to avoid potential copyright violations in general. Hm, well I will certainly update section 15. I guess I will have to go try to find a more comprehensive list of monsters somewhere. Seems strange that they would not include all of those monsters in the document. Thanks for the info. This page (http://www.dragonsfoot.org/forums/viewtopic.php?t=26955) has a pretty good break down of monsters and their OGC/non-OGC status, but it's only for monsters that originated in 1e or before. I ctrl+f'd bullywug, and it appearedd in the non-OGC section. For some reason, the system would not let me leave a rating in the review subsection, so placing it here instead.